For 7 days and then part two starting. The art includes pages by Kirby, Starlin, Wood, Colan, Buscema and more. It will be available for viewing at the New York Comic Con. 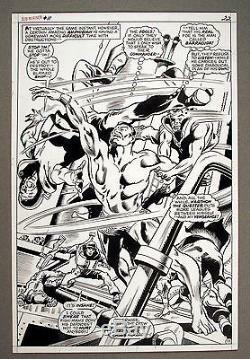 Gene Colan from Sub-mariner #11 Page #17, Knockout Splash Action Page, By Genial Gene Colan & The Great George Klein Inks from 1969. The Page measures 10.5" x 15.5". Superworld Comics, owned by Ted VanLiew has been in business for 27 years. Ted is an advisory to the Overstreet Price Guide Our grading is strict and professional. Our customer service is exceptional. The Superworld Team guarantees your satisfaction! Joe, Ted, Jose, and Lisa See us at shows around the country! The item "Gene Colan Sub-mariner #11 Page #17 Splash Action Page, Battle Page, Klein Inks" is in sale since Monday, October 03, 2016. This item is in the category "Collectibles\Comics\Original Comic Art\Interior Pages".